Set-top boxes often keep drawing their full power requirements even when they look as if they’re turned off, making them a big energy eater. The LA Times even reported last year that set-top boxes have become the second-largest energy user in many homes. Game consoles can use quite a bit of electricity as well, especially if they’re kept plugged in and on standby mode. Space heating/cooling has represented a big chunk of home energy use for a long time, generally floating in the range of 40% to 50% of total utility bills. And your system may be using more electrical energy than you expect. Even if you have a furnace or heat pump that runs on gas, it’s likely you have an electric-powered furnace fan that drives up utility costs. It may not be cost-effective to change your heating system, but you should at least consider a professional energy audit that can give you an idea of where heat/AC is escaping your home -- so you can keep the heat in and get the associated energy savings. Heating water typically accounts for 14% to 18% of the average utility bill. A combination of installing efficient or tankless water heaters -- which heat only as much water as needed -- and taking shorter showers can tackle the problem. You might also consider using cold water for laundry. You probably expect large kitchen appliances such as your fridge, freezer, range and dishwasher to draw a lot of power. But if they’re new and efficiency-rated, they probably use less electricity than you think: The average fridge bought today in the U.S. uses 75% less energy than an average 1975 fridge, despite being 60% cheaper and 20% bigger. The real drain in your kitchen is probably your microwave, which draws phantom power when you’re not using it. New standards that will come into effect next year will make microwave ovens less wasteful; in the meantime, you can choose to unplug yours if you use it rarely. Personal devices that run on batteries, such as smartphones, tablets and laptops, often have inefficient chargers. One report from the Digital Power Group recently claimed that an iPhone uses more power in battery charging, Wi-Fi connectivity and data use than a mid-sized efficient refrigerator. Unfortunately, there’s no clear way to reduce this cost, but you can research the efficiency of your particular devices and go from there. Did any of these surprise you? 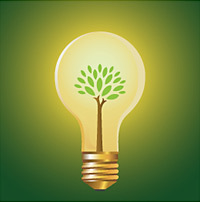 What other changes in the home can contribute to energy conservation? Discuss in the comments.